NZ's MOST COMPREHENSIVE MUSCLE SUPPLEMENT! THE ULTIMATE IN BUILDING MUSCLE, IMPROVING STRENGTH & RECOVERY. 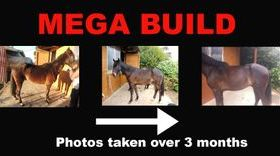 MEGA BUILD WORKS 4 WAYS! Please note that if you are browsing on a mobile - click the arrow in the top right hand corner of your screen to purchase. MEGA BUILD builds muscle and aids healing fast! MEGA BUILD is a comprehensive supplement that supports the development of muscle, recovery from exertion and injury and helps promote gastric health. ~ A full profile of concentrated amino acids for enhanced protein digestion and muscle development and repair. ~ Nucleotides to enhance cell repair, gut health and recover from injuries. ~ Probiotic for optimum digestion. ~ Organic chromium for enhanced muscle building effect. Many people use an amino acid concentrate to help improve feed and protein quality and fuel for developing muscle and strength, however we have taken that a step further. Adding nucleotides and other functional nutrients to the mix adds another dimension to how the product works. Nucleotides are organic molecules that are the building blocks of DNA and RNA. They also have functions related to cell signaling, metabolism, and enzyme reactions. They improve cell transfer and nutrient absorbtion and help improve digestion. Healing is accelerated. Organic chromium supports the development of muscle and sugar metabolism, and an added probiotic improves hind gut performance and digestion, and stablises bacterial balance helping to prevent laminitis and other issues caused by bacterial die off in the hind gut. The result? Better health and feed utilisation. Improved gut performance. Faster more stable healing from all aspects. Better recovery afer exersion. Improved top line or lean muscle depending on the workload and breed of the horse. Better coats and hoof quality. *Boosts hard working horses & build lean muscle. Hold condition better in hard work. *Builds topline on show and dressage horses working "round." *MEGA BUILD improves the protein quality of the diet without over feeding protein. *Ideal for rescue horses and those that are protein deficient. *Faster and better healing of tendon/ligament/skin injury. Any injury will benefit. *Promotes maximum uptake of nutrients. *Promotes a healthy gastric system. Because your experience and the results you acheive are very important to us, before using MEGA BUILD to improve the muscle and condition of your horse, please make sure you are feeding enough to maintain or acheive the condition score you desire and if your horse has a history of being a poor doer or has a picky or intimmitant appetite, we strongly recommend you start with Gastro Go to improve appetite and comfort before using MEGA BUILD. A horse with gastric discomfort will generally not respond well to feeding until this is addressed. or more amino acids. Working, recovering, growing and weak horses have higher protein requirements, but excess protein can be a problem. MEGA BUILD works to fill in the amino acid "gaps" to make sure the protein your horse gets is high quality and utilised fully without the problems associated with over feeding protein. This way you get maximum results with feeding less. 2 ~ Nucleotides are star performers in this formula! Research shows they significantly promote gut health, nutrient absorbtion, and cell repair. Valuable for horses recovering from injury or illness they also help your horse get maximum benefit from his feed and nutrients fed. They improve the quality of the gut wall making your horse more resilient to gastric issues. 3 ~ High levels of live culture yeast Yea Sacc is a valuable addition to the formula. It improves digestion and the beneficial bacterial flora in the gut, promoting healthy and efficicent digestion. 4 ~ MEGA BUILD has high levels of safe, non toxic organic chromium. Chromium has long been used for its muscle building effect. MEGA BUILD effectively promotes muscle development, condition, gastric health and recovery 4 ways! MEGA BUILD WILL NOT CHANGE OR EFFECT TEMPERAMENT. "For a rather long period of time I have been trailing several different and highly recommended conditioning supplements in order to find a supplement that would support and aid the muscle and top- line development of my horse Monza. Being a big framed horse of 17.2hh it has always been a challenge to make him gain condition and to develop the required muscle condition to perform as a top dressage horse. 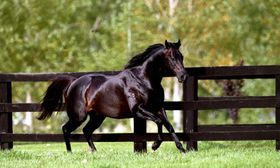 That was until I was recommended ELITE EQUINE MEGA BUILD , it is a truly amazing conditioning supplement with undeniable results and an understated name. I am also feeding ORGANIC PLUS. With the support of ELITE EQUINE MEGA Monza was able to develop a very strong top line which enables him to excel in his collected work and to shine a dressage horse. I highly recommend a supplementation of the ELITE EQUINE MEGA BUILD and ORGANIC PLUS for anyone trying to improve the horses condition and performance." MEGA BUILD comes in a 1 month or 3 month supply. Daily dose is 3 scoops a day. We have found Mega Build to be extremely palatable.